Once again, I had the honor of people visiting me in a space where my pictures are displayed. 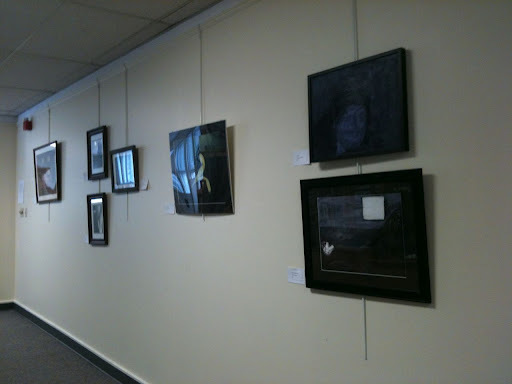 This reception was at the Dyer Library in Saco, ME and my pictures will be there for the month of February. Ten or so people came to the reception, or about 15 if we count the children (and why not?). I’m never sure how I “do” at these events because it becomes a bit of a blur. I’m part host, part artist, part visitor at a party and I spend a lot of time just breathing and realizing the experience of others can’t be determined by me. People were generous, kind, and had some beautiful comments and questions. At one point I considered making a sort of more formal welcome statement, but decided to leave it entirely casual. I still can’t get over the fact that people took time from their schedules to support me and my art. It’s flattering and mystifying and amazing. Here are a couple photos of the display and a couple quickly shot photos of two of my newest pieces. 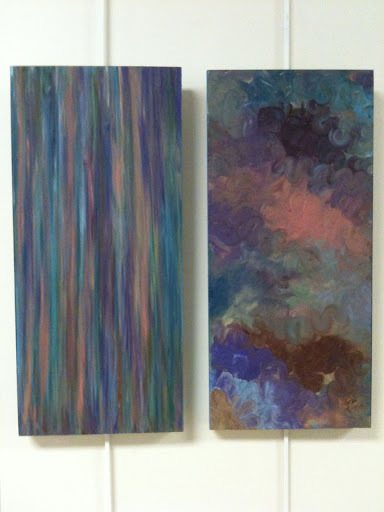 This entry was posted in art and tagged art, creativity, mindful living by serenebabe. Bookmark the permalink.